Ultra-high temperature processing (UHT), ultra-heat treatment, or ultra-pasteurization sterilizes food by heating it above 135 °C (275 °F) – the temperature required to kill spores in milk – for 1 to 2 seconds. 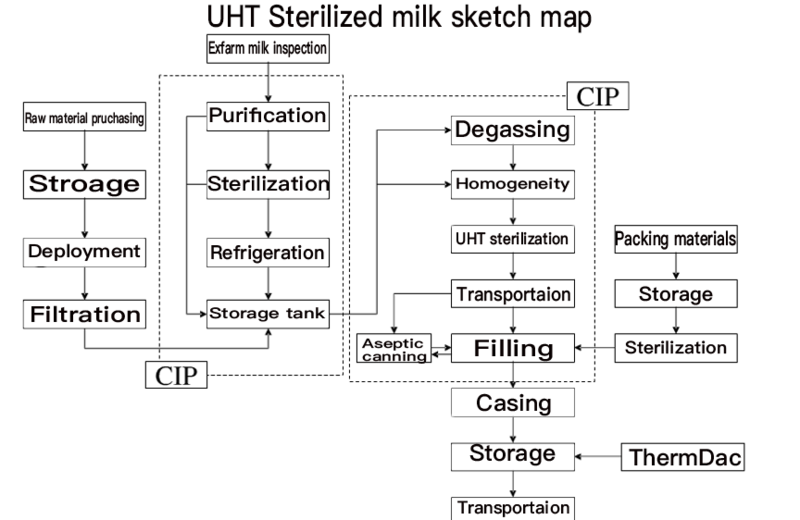 UHT is most commonly used in milk production, but the process is also used for fruit juices, cream, soy milk, yogurt, wine, soups, honey, and stews. The heat used during the UHT process can cause Maillard browning and change the taste and smell of dairy products. An alternative process is HTST pasteurization (high temperature/short time), in which the milk is heated to 72 °C (162 °F) for at least 15 seconds. UHT milk packaged in a sterile container, if not opened, has a typical unrefrigerated shelf life of six to nine months. HTST pasteurized milk has a shelf life of about two weeks from processing, or about one week from being put on sale. In the heating stage, the treated liquid is first pre-heated to a non-critical temperature (70–80°C for milk), and then quickly heated to the temperature required by the process. For higher efficiency, pressurized water or steam is used as the medium for heating the exchangers themselves, accompanied with a regeneration unit which allows reuse of the medium and energy saving. The quality of the sterilized milk is determined by the raw milk. Therefore, the quality of raw milk must be strictly managed and carefully tested. Only sterilized milk can be produced from raw milk that meets the standards. The purpose is to remove dust and impurities from the milk. The purpose of standardization is to ensure that the milk contains the specified minimum amount of fat. The requirements for milk standardization vary from country to country. Generally speaking, the fat content of low-fat milk is 0.5%, and that of ordinary milk is 3%. In China, the fat content of sterilized milk is 3.0%, and all non-standard milk must be standardized. Homogenization is usually carried out at a homogenous temperature of 65 ° C and a homogenization pressure of 10 to 20 MPa. If the homogenization temperature is too low, viscous may occur. 5 Pasteurized fresh milk is often contaminated by many microorganisms (80% of which are lactic acid bacteria). Therefore, when using cow's milk to produce milk for disinfection, the easiest and most effective way to spread the hazard is to use heat for sterilization or sterilization in order to improve the stability of milk during storage and transportation, avoid rancidity and prevent microorganisms. In order to inhibit the development of bacteria in the milk and prolong the preservation, it is still necessary to cool in time, and the milk is usually cooled to about 4 °C. Ultra-high temperature milk and sterilized milk can be cooled to below 20 °C. The purpose of filling is mainly to facilitate retail, prevent external impurities from being mixed into the finished product, prevent microbial re-contamination, preserve flavor and prevent absorption of external odor and produce odor and prevent loss of vitamins and other components. Filling containers are mainly packaged in glass bottles, vinyl plastic bottles, plastic bags and plastic coated paper bags. The pre-cooled 5°C fresh milk is absorbed by heat in the heat recovery section, and the temperature reaches about 65°C. It is homogenized by homogenizer, and then heated to 85°C for more than 15s. Finally, it is cooled to 5°C with ice water and sent to the packaging workshop. Packed in bottles or soft plastic bags. In the sterilization section, hot water is used as the heating medium, the cooling section uses ice water as the cooling medium, and the heat recovery section uses the sterilized milk as the heat medium to fully utilize the heat of the hot milk to heat the cold milk, and the heat recovery rate can be reached. 85%~90%. Plate heat exchanger is widely used in the food industry, with ice cream as the representative product. 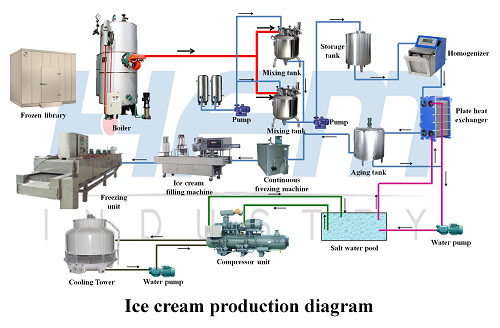 The production of ice cream mainly includes steps such as the mixing of the mixture of sterilizing and cooling, the filling and packing of ice cream. Before into the homogenizer, ice cream mixed material needs to be strictly controlled between 65℃ ~ 70℃ through the plate heat exchanger. When the temperature is too low, fat is easy to be condensed; when too high, material is prone to have hot stink. And then before into the aging tank, use the plate heat exchanger for sterilization, and make the material temperature up to the aging of the required temperature. Make heating and sterilization done at the same time to save cost. Ice cream material is relatively viscous, Hofmann's BNF series of plate heat exchanger with wide flow path, and high heat transfer efficiency, can be a good choice for this heat transfer work.